How can we explain elongated skulls that are thousands of years old that contain genetic material “unknown in any human, primate or animal known so far”? For months, many of us have been eagerly awaiting the results of the first DNA tests to ever be performed on the famous Paracas skulls. The results for one of the skulls are now in, and the scientist that did the testing is declaring that this skull represents a “new human-like creature” unlike anything that has ever been discovered before. So are these actually Nephilim skulls? Do they come from a time when the world more closely resembled “the Lord of the Rings” than most people living today would ever dare to imagine? There are those who believe that extremely bizarre hybrid races once roamed the planet. With each passing year, the scientific evidence continues to pile up on the side of those that are convinced that the Nephilim actually lived among us. As the knowledge of this evidence becomes more widespread, what is that going to do to the commonly accepted version of history that all of us have been taught? Whatever the sample labeled 3A has came from – it had mtDNA with mutations unknown in any human, primate or animal known so far. The data is very sketchy though and a LOT of sequencing still needs to be done to recover the complete mtDNA sequence. But a few fragments I was able to sequence from this sample 3A indicate that if these mutations will hold we are dealing with a new human-like creature, very distant from Homo sapiens, Neanderthals and Denisovans. 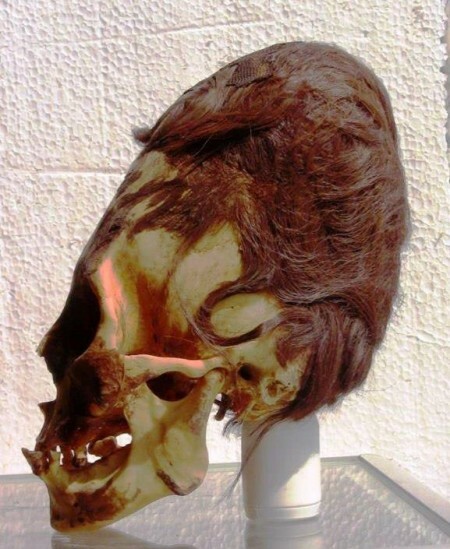 The cranial volume is up to 25 percent larger and 60 percent heavier than conventional human skulls, meaning they could not have been intentionally deformed through head binding/flattening. They also contain only one parietal plate, rather than two. The fact that the skulls’ features arenot the result of cranial deformation means that the cause of the elongation is a mystery, and has been for decades. In fact, in a previous article I discussed how a sample of red hair from one of these skulls was sent to a lab to be analyzed. The tests on that sample of hair also showed that these skulls are not human. Or at least they are not fully human. So can we conclusively say that these are Nephilim skulls? Are these really Nephilim skulls? In my opinion, the evidence is beginning to stack up in that direction, but we must be cautious and patient for all the evidence to come in. You can find the photo that he was talking about right here. ▶ Interview with Brien Foerster — Unravelling the Genetics of Elongated Skulls – YouTube. And you can find another video interview with Foerster right here. Of course this is not the first time that a very bizarre skull has been tested. In a previous article, I discussed how DNA testing of the Starchild skull showed that it was not human. So who were all of these extremely bizarre human-like creatures that were roaming around on our planet just a few thousand years ago? Could it be possible that they were actually the Nephilim or their descendents?